Well, it seems that Blizzard decided to hit Honorbuddy again with this current ban wave, not long after the December one. As usual, not everyone using the bot was banned, but it’s safe to say that a huge part of its customer base got caught, as reported on the buddy forum. Even though Honorbuddy got hit a few times, and pretty hard too, it seems that it’s still the most popular go-to bot when it comes to automating things in WoW. This might be unrelated, but the timing of the ban is very similar to the timing of Blizzard deciding to include Warlords of Draenor into the World of Warcraft pack, thus making it a bit more comfortable for banned players to purchase new licenses and give up on the closed ones. Issued ban mails were mostly for “Exploitative Activity: Abuse of the Economy” and “Use of Bots or Third-Party Automation Software”. Blizzard Entertainment has suspended this World of Warcraft account after identifying the usage of bots or other cheat software. These programs (commonly called cheats, bots, or hacks) automate certain aspects of gameplay, or provide unintended advantages and abilities to the player. This type of cheating undermines other players’ experience and severely upsets the balance of the game environment. This World of Warcraft account will be reactivated on 2016/11/19. Update: Blizzard has issued an official forum statement in regards to the current ban wave, and it seems that the number of banned players is in the thousands. 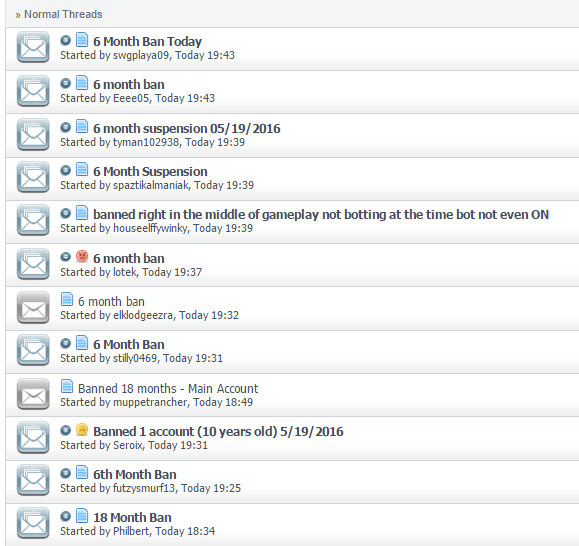 This ban wave came as a bit of surprise, given that the December 6-month suspension didn’t expire yet, so it might be that Blizzard is really trying to get rid of anyone who uses any type of cheats or third party software in association with World of Warcraft, thus eliminating the ones who got away a few months ago, as well as whoever purchased a new license and started botting back. For the time being, anyone who uses such tools to automate their gameplay should at least take a break, and also not resort to using a different bot than Honorbuddy, since it’s very likely those might be next on the hit list. If you’re among the ones who got banned, we’ve got your back! Let us know through our contact form or Facebook page and we’ll get back to you! This is pretty much all we have so far on the Honorbuddy WoW ban wave on May 2016, and we hope you found this article useful! If you have anything else to add, please let us know through our comment section. We’ll keep this post updated, so be sure to check it every now and then to see if anything changed! Should you require our help, please don’t hesitate to check out our WoW unban service!